The Tuolumne River is rafting Nirvana. This dam controlled summer run has fun Class IV and IV+ rapids and beautiful scenery. The "T", as it's lovingly called begins in Yosemite on the North Face of Mount Lyell and flows through Tuolumne Meadows and the Grand Canyon of the Tuolumne before being impounded by Hetch Hetchy Reservoir. Downstream of the park boundary the Tuolumne flows through a classic Sierra Nevada river canyon full of Class IV Rapids and great campsites. The T can be done in one day but why? The camps on the Tuolumne are downright beautiful and the side hikes to water slides on the Clavey River and North Fork of the Tuolumne are well worth the effort. 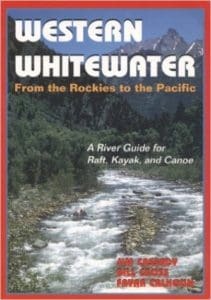 ARTA River Trips (800) 323-2782 is a non-profit organization that runs 18 of the best rivers in the West. Mile 0: Put-in at Meral's Pool. Part of the adventure is a 6 mile drive down a steep dirt road to reach put-in. Mile 0.1: Rock Garden (IV) is one of the most difficult rapids at low water because there are small channels and several places to wrap a boat. The rapids Nemesis (IV), Sunderland's Chute (IV), and Hackamack Hole (IV) come in quick succession. Mile 1.5: Ram's Head (IV goes to V above 3,500 cfs) comes after a series of Class IV rapids. This is one of the most difficult rapids at high water. Below here you'll run India (IV), Phil's Folly (IV), Zach's Falls (IV), Stern (IV), and Evangelist (IV). Mile 5.4: The Clavey River enters on the right and Clavey Falls (IV/V) is just downstream. This is the most difficult rapid on the run and is either Class IV or V depending on flows and who you're talking to. Mile 9.5: Grey's Grindstone (IV) is a nearly mile long rapid that is the favorite of most river guides. The next few miles bring rapids like Surf City (III), Steamboat (III), and Cabin (IV). Mile 12.9: Big Creek enters on the left and Hell's Kitchen (IV) is just downstream. Mile 15.1: The North Fork of the Tuolumne enters on the right hand bank. If you have time, there's a great hike/scramble up to a swimming hole and natural waterslide at Devil's Gate. Mile 15.8: Don Pedro reservoir starts here when it's full. When it's not full you'll enjoy many more rapids including Boilermaker (III), Matterhorn (IV-), and Pinball (IV). Mile 17.8: Pinball (IV) is usually covered by the water of Don Pedro Reservoir, but in drought years this rapid comes alive. There are several routes and all of them involve slamming into rocks. Scouting is a good idea here. Mile 18: Take-out at Ward's Ferry Bridge.